My heart is filled with so much joy this week! 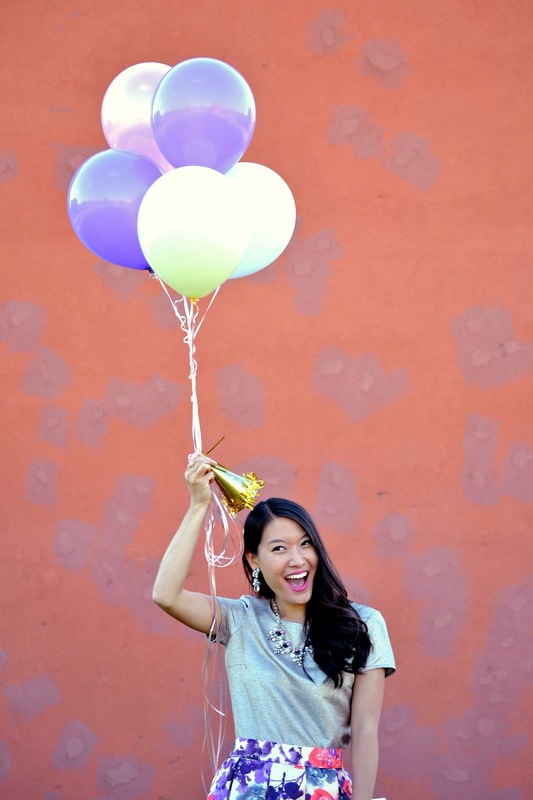 Because it's time to celebrate my birthday week! Birthdays have always been a highlight in my life. Mostly because I was so lucky to have parents who made my birthday feel special. I still remember every birthday party. There was a Chuck E Cheese phase, then the roller blading phase, and then those fun birthday sleepovers. But as I grow older, my birthday is still fun, but it's more a time for me to reflect on how I've grown over the past year. Every experience shapes who you become. I find it important to take the time to reflect on that truth, to learn from your mistakes and your accomplishments and carry those lessons into your future. So much has happened this past year. So many joys, so much junk, but a ton of Jesus. Honestly, I'm blown away by the pages that have been written in my life book in one tremendous year. The friendships I've made this past year, the places I've seen, the impossible that became possible, the sorrows that became stories of hope, etc. All of it has molded me to be who I am this very day. I look forward to what the next year will bring! To even get the chance to share my story with you is so special. I'm so thankful for you since Grace in Style would not exist without your continued support and love. Since I love birthday surprises, I have some special surprises for you this week! So be sure to follow along! 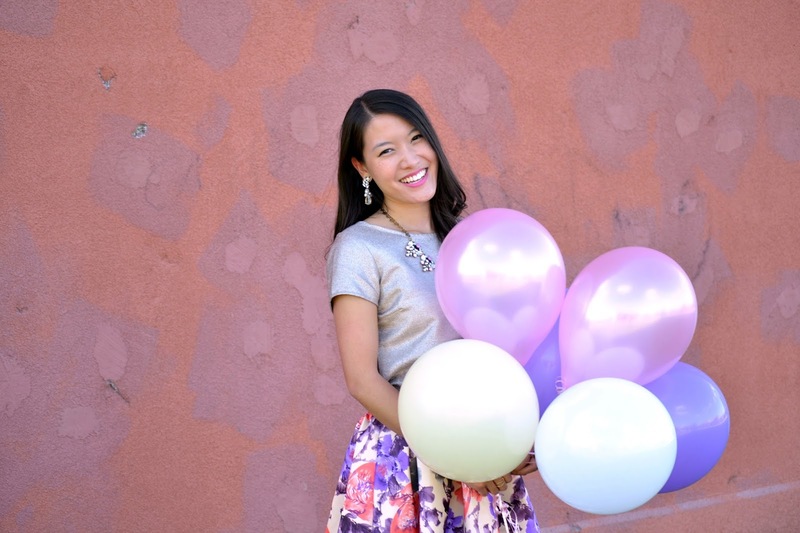 I love that your skirt matches the balloons. It's such a cute print. Literally everything about this outfit is perfection. 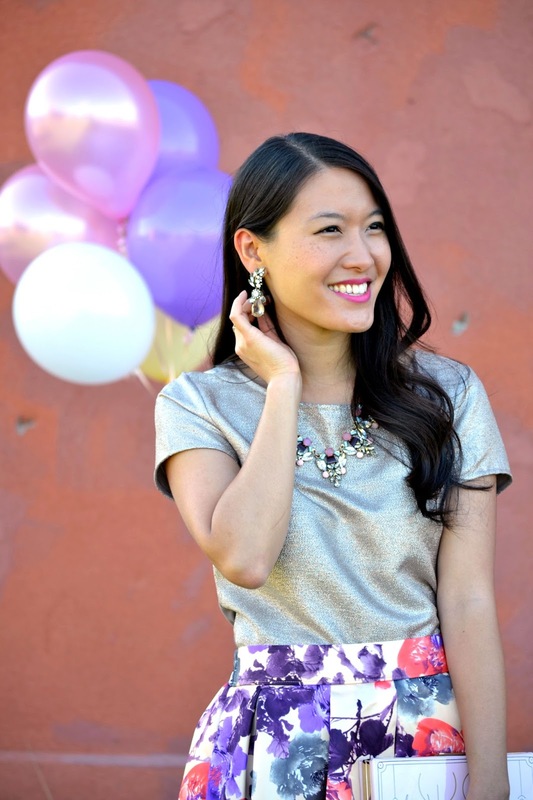 I love the metallic skirt, floral midi skirt, jewellery, and the bow heels! Cutie! I wish I was home to celebrate with you! However I am sending you love and positive vibes from LA! And I will be seeing you very soon, so we will have to celebrate then!! Skirt is amazing - Happy Birthday!! Happy birthday!! 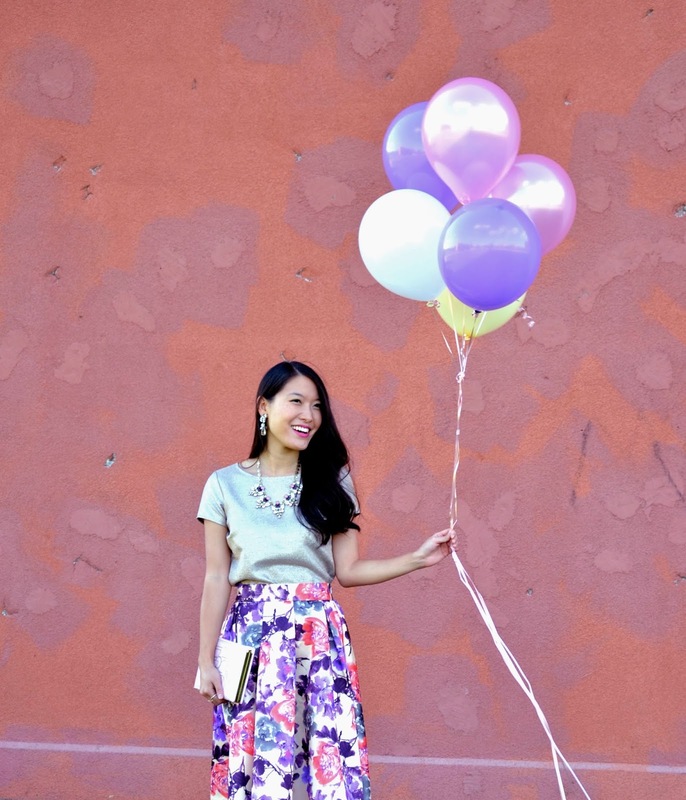 The balloons are so cute and festive and go so perfectly with that gorgeous skirt! :) Great shots! Happy Birthday fellow Libra!! 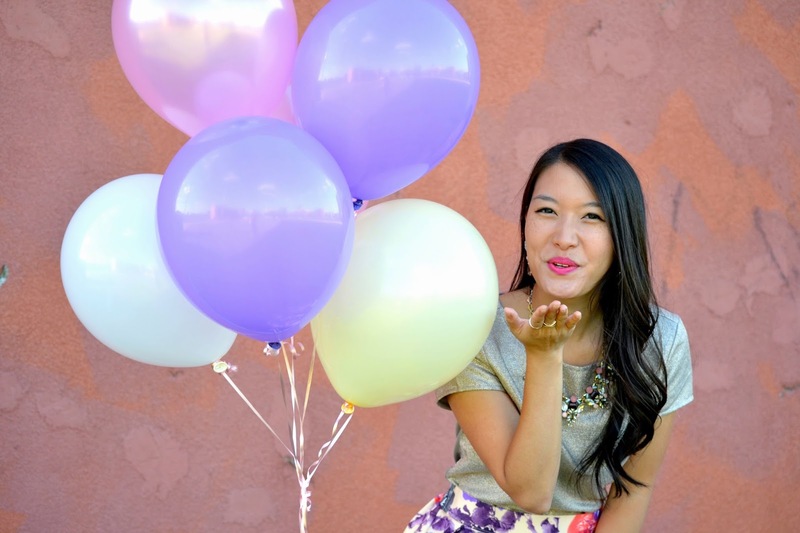 Hope you have an amazing birthday week! Love the look, and pictures!! Happy Birthday! 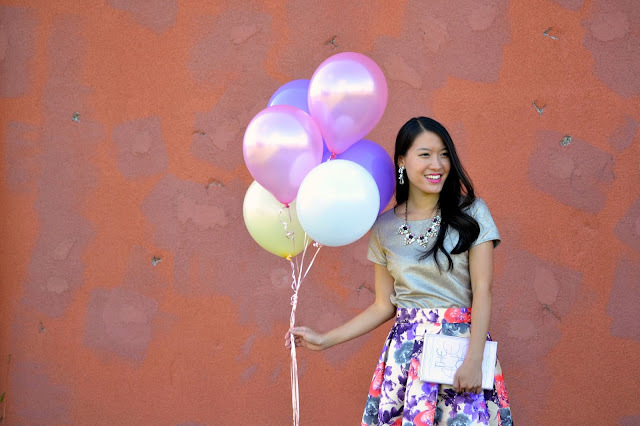 This is such a stunning birthday look! Love your bow ring! happy birthday! that skirt is so gorgeous!! 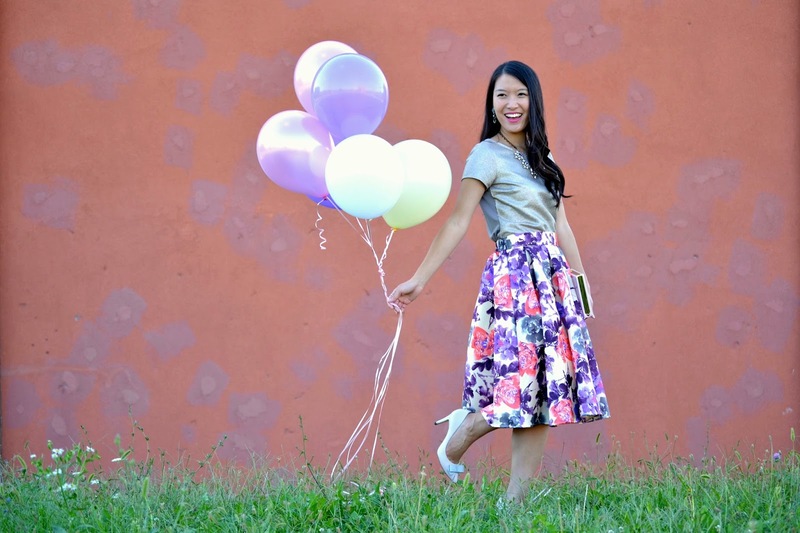 Gorgeous skirt! Happy birthday, enjoy it!